If you were one of the many people who used to search out probiotic yogurts and drinks in the supermarket, you might be wondering where they have all disappeared to? Since December 14th 2012, the word 'probiotic' is no longer permitted on food packaging, advertising and other media such as websites. The European Food Safety Authority (EFSA) is in charge of setting legislation on the use of health claims on food - this means when a food is marketed as having a benefit to health (such as a probiotic supporting digestive health). The overall aim of creating legislation on health claims is to make it easier for shoppers to buy healthy food without any chance of being misled by potentially unproven claims. The term 'probiotic' was used to describe a food with added live bacteria (commonly known as 'good' or 'friendly' bacteria) that had been shown to have a beneficial effect on health. Scientific studies investigated the effect of these so called 'friendly' bacteria on a whole range of areas from keeping our digestive systems healthy, to helping combat infectious diseases in children. Medical and scientific support for probiotics resulted in a raft of products available on our supermarket shelves offering to boost your health through eating probiotic yogurts, or consuming a probiotic drink. For many people, these products became part of everyday life, with daily consumption being the norm. The bacteria themselves haven't changed at all. The types (known as strains) of bacteria are still around, and many products still have the same bacteria in them as they always had. So the products you buy will taste the same, and have the same effect on your health as they always have had. The change is linked to what marketing people are allowed to say about their products, and how the product might benefit our health. The term 'probiotic' is no longer permitted as it is thought to suggest a health benefit. Although there is a great deal of scientific evidence to support the health benefits of probiotics in the human diet, it was decided by EFSA that there was insufficient evidence to allow the use of health claims linked to probiotics. If you are one of the many people who have enjoyed probiotic products over the past few years, don't worry! 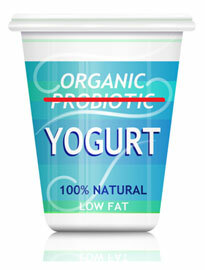 Many of these yogurt and drink products are still available - they just won't say 'probiotic' on their labels. You will, instead, need to look out for the proper bacteria names on the label such as Bifidobacterium or Lactobacillus - these are the better known types of 'good' bacteria which have been shown to survive stomach acid to reach the intestines alive. Companies that make products with these 'good' bacteria in them will no longer be able to talk about their products having health benefits, so you will notice that adverts are different now, and won't be talking about how the yogurt or drink can benefit your health. Don't worry - the change in name will have no impact on the calorie or fat content of your favourite food! Continue to look at nutrition labels, or use our food database to search for the calorie information. Most products containing bacteria will come in a 0% fat version, so look out for the lower calorie option whenever you can!